The first time I picked up LaoZi’s DaoDeJing 道德經, I could not truly understand one single sentence. I found this interesting, as I already had a solid foundation in classical Chinese literature. The very first sentence, 道可道非常道DaoKeDaoFeiChangDao, which literally translates as “The Dao that can be the Dao is not the constant Dao” initially felt like a maze to me. I used my knowledge of classical Chinese to interpret the meaning as “The Dao that can be spoken is not the eternal Dao.” Still, I felt slightly puzzled. After some years of a dedicated inner cultivation practice, I picked up the book again and I found that could understand it a little bit more than before. When reading the first sentence again, I decoded a different interpretation: “The Dao, discussed in any language, loses its original meaning.” In other words, we cannot truly understand the Dao simply through words alone. The way to access the Dao is through direct bodily experience. In order to gain experiential knowledge, you must be seriously committed to your inner cultivation practice. I have had a concentrated focus on Qigong, Neigong, marital arts and other internal cultivation practices since the 1970s. I continue to come back to the DaoDeJing again and again. Each time, I gain insights based on the layers of meaning that reveal themselves to me. Now, the very same opening sentence tells me that the entire book is not a text that passes philosophical truths to us. Behind the words is a powerful teaching encouraging us to use our cultivation practice to connect with the Dao and Xian 仙 – immortality. Over the last twenty years, I have been preparing to write a commentary on DaoDeJing from a Qigong/internal cultivation perspective. In this article, I will share a small piece of my project with you. In the Eastern Zhou Dynasty (circa 770-256 BCE), there was a famous astronomer named YinXi 尹喜. One evening while he was reading the sky, he noted a mass of purple colored Qi accumulating in the East. He was astonished by this natural phenomenon, and recognized it as an omen indicating that a great sage or truly enlightened master was traveling from the eastern direction. He made a predication about the master’s travel route – passing through HanGuGuan 函谷關and arriving in LouGuan 樓關. YinXi subsequently traveled to LouGuan and built himself a hut to wait for the master’s arrival. After several days, an old man with long gray eyebrows and beard rode towards his hut. He was riding on a green colored ox. YinXi immediately understood that this was the person he had been waiting for. He invited the old man to be his guest in his hut, hoping that he could study with the old master. The old master, LaoZi, saw that YinXi was seriously committed to his own inner cultivation and agreed to spend some time teaching him. After three months had passed, LaoZi decided he was ready to keep traveling onwards. YinXi humbly requested that LaoZi write down some teachings for him before he left, so that YinXi would be able to continue his studies even if they would not have a chance to see each other again. LaoZi consented, extending his stay to write what we now know as the DaoDeJing for his student, YinXin. YinXi continued to live a hermit’s life in LouGuan, continuing his cultivation practice with the guidance of LaoZi’s DaoDeJing. Years later, after YinXi achieved true enlightenment, he wrote the renowned Daoist classic WenShiJing 文始經. From this creation story, we see that the original purpose of the DaoDeJing is to provide guidance for our spiritual cultivation. It is a great blessing to create opportunities that allow you to focus on our spiritual selves. Through our Qigong practice we can continuously refine our study and understanding of the DaoDeJing. In general, the first chapter of each of the Chinese classics reveals the purpose of the rest of the book. Consequently, it is always worth spending extra time on the first chapter so that you can get a real sense of the spirit of the book. Please allow me to make a set of GongFu 功夫 tea so that we can savor the first chapter of the DaDeJing together slowly (please read my book, Vital Breath of the Dao, if you are interested in learning more about the GongFu tea ceremony). Let us sip our tea and discuss the first line of DaoDeJing together. The Dao that can be spoken is not the eternal Dao. Tea Commentary: The original meaning of Chinese character 道 (Dao) is simply a trail, road, or path on which to walk. Later on, the meaning expanded to include rule, law, way, method, and the spoken word. In traditional Chinese philosophy, the Dao also refers to the way of nature or the universal law. In the first sentence of the DaoDeJing there are three Dao characters. The first and the third instances use Dao to mean the way or the method, while the second occurrence is used to mean speak or express. The ways that are expressed in our daily lives, such as those pertaining to politics, business, and knowledge do not provide the pathway to the Eternal Dao – immortality or true enlightenment. The way to attain the Eternal Dao is wordless. The path to the Eternal Dao involves gaining a deep understanding of your physical body, your Qi body, and your spiritual body. That is because the path to the Eternal Dao is not mental or verbal. Rather, it is experiential. We reach the Eternal Dao through the same method as we enjoy our tea. We savor the tea, experiencing it directly through our senses – by tasting, smelling and seeing it, and by being in touch its affects on our bodies – that we accurately understand the rich and subtle complexities of the tea. If I tried to describe the flavor, fragrance, and color of the tea to you and never offered you the opportunity to savor the tea yourself, you would gain some superficial knowledge about the tea but you would never grow to truly understand it. We learn about the Eternal Dao not only through the Dao of tea, but also through the Dao of Qi. Traditional Qigong forms serve as another pathway to the Eternal Dao. By cultivating our Qi, we learn to experience the Eternal Dao through our bodies, our breath, and our spirits. Guan觀, which means observe or observation, is one of the traditional names for Qigong. Guan is also the name used to refer to all traditional Daoist temples in China. For thousands of years, Daoist temples have been much more than regional sites for ceremony or religion. Traditional Daoist temples have been and continue to be havens where Daoist masters, following LaoZi’s teaching, diligently practice various methods of Guan, or inner observation. Guan is both the secret and not-so-secret method of LaoZi’s own Qigong and inner cultivation practice. In China, the dragon is the most common icon, replicated on businesses and temples, in homes, on paintings, ceramics, clothes, etc. 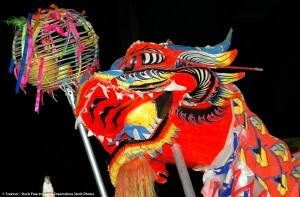 However ubiquitous in Chinese culture, the dragon itself is still a mystery – both seen and unseen, ever present but little understood. Similarly, although the DaoDeJing is arguably China’s famous book, most people don’t realize that the DaoDeJing is actually LaoZi’s cultivation handbook. The secret to understanding the DaoDeJing is not a secret at all. Through a committed inner cultivation practice and guidance of an illumined master, you can decode the enigmas within these five thousand words and find the path to the Eternal Dao. Acknowledgment: I’d like to express my gratitude and appreciation for my wife, Dr. Karin Taylor Wu, for her helpful suggestions and her editorial assistance. Master Zhongxian Wu is the lineage holder of four different schools of Qigong, Taiji and martial arts. Since 1988, he has instructed thousands of students, both Eastern and Western in ancient Chinese wisdom traditions. Master Wu is the author of Vital Breath of the Dao, Seeking the Spirit of the Book of Change, The 12 Chinese Animals, Chinese Shamanic Cosmic Orbit Qigong and of Fire Dragon Meridian Qigong. He synthesizes wisdom and experience for beginning and advanced practitioners, as well as for patients seeking healing, in his unique and professionally designed courses and workshops. For detailed information, please visit www.masterwu.net. This entry was posted in Daoism, The Daily Daoist and tagged chang, chinese dragon dragon, Dao, eternal dao, fei, ke, purple colored qi, Qigong, spiritual cultivation. Bookmark the permalink.